Located in Honor Michigan, we are minutes from Sleeping Bear Dunes, Traverse City, Beulah, Frankfort, Leelanau, Interlochen, Glen Arbor, and Crystal Mountain. The Platte River is right next door for great kayaking, canoeing, tubing and fishing. Our cabins offer the rustic charm of an Up North cabin with the amenities of a modern motel and the perfect location to explore all of Benzie, Traverse and Leelanau counties. Please call 231-325-2200 or reserve your cabin on line. Spring is in the air and all that snow is almost gone. We're keeping our fingers crossed for a mid-April opening! ​Check open dates on the reservations page calendar. Discount for stays of 3 nights or more. Reserve online or give us a call to book your cabin today! Many thanks to Dan for these fantastic aerial shots. Want a little more room? Want to be a lot closer to Crystal Lake? ​Check out Cedar Ridge Cottage! 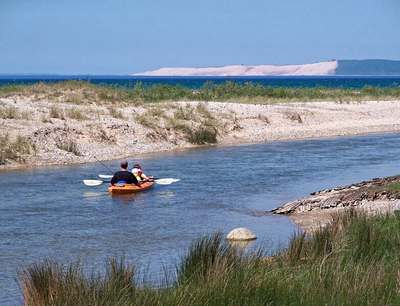 Enjoy central location, ten minutes to Sleeping Bear Dunes.